Gold Dust Day Geckos, a smaller member of the Day Gecko family, are both beautiful and charming as terrarium pets. These reptiles are found in the islands surrounding Madagascar and live in semi-arid to moist forests. In the wild, they feed on insects, nectar and fruit. The species can reach lengths of more than 6 inches, and the Gold Dust Day Gecko lifespan is 10 years or more with proper care. Gold Dust Day Geckos are named for the gold speckling they develop on their skin as adults. 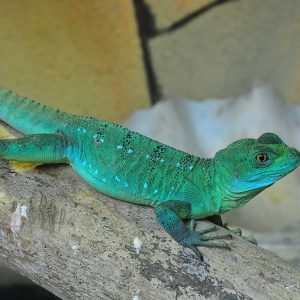 Their coloring is mostly bright green with red spots between the eyes and down the back. Some individuals may have blue accents on the toes and tail. I’m lucky enough to have a friend who keeps many gecko species, including Gold Dust Day Geckos. I visited Valerie at her home to see them in action and learn about keeping them. Along with the gorgeous coloring, the behavior and interaction between geckos is a joy to watch. Many will set up their own territory within their tank and compete for the best basking spots. I got to watch Gold Dust Day Geckos racing one another like ninjas to the food dish, especially for a bit of mango. They must have good noses because they home in on food very quickly. They have a habit of swishing their tails from side to side like a cat when approaching other tank mates. Gold Dust Day Geckos breed very well in captivity if the conditions are right. 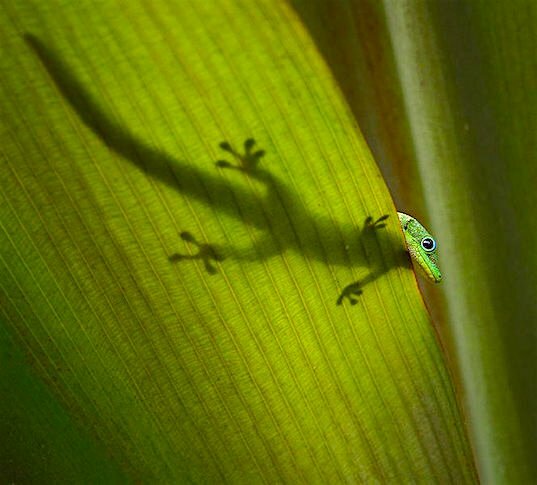 Like many Day Gecko species, they lay their eggs within tree hollows or plants. They deposit 1–2 eggs every few weeks. Valerie’s group had about 5 tiny Gold Dust Day Gecko babies running around, some smaller than others. They probably hatched a few weeks apart. Gold Dust Day Geckos are pretty sneaky too — a few got close to escaping while the cage was open when Valerie was feeding them. The parents were leaving the babies alone while I visited, but they can cannibalize. Valerie will eventually have to put them in a different enclosure. 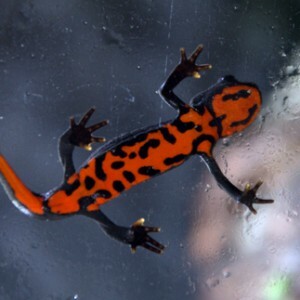 For housing a pair of Gold Dust Day Geckos, use an 18 x 18 x 24-inch terrarium-style tank. House no more than 1 male per tank because males are aggressive toward one another. For the bottom of the terrarium for your Gold Dust Day Geckos, you can use a combination of Eco-Earth and potting soil to help hold in humidity and create a good substrate for growing live plants. Using live plants will not only create a natural environment for the geckos but also will aid in raising humidity. Bamboo hollows and cork rounds are a favorite of Gold Dust Day Geckos — they offer great climbing and hiding spots. Cork flats and grape vines are a nice addition for added climbing areas. 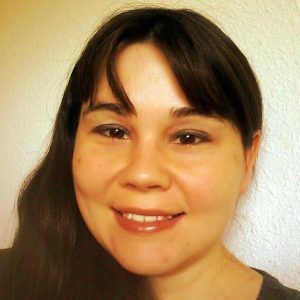 Using low-wattage bulbs for maintaining the heat. In terms of Fahrenheit, the basking spot should reach into the low 90s, while the cooler end of the tank can drop into the low 70s. UVB lighting is also a must for this daytime-active species. Fluorescent strip lights are the most common option. Know that these animals can lose their coloring if not provided proper heating and lighting, often turning drab and dark. To maintain humidity at 60%, mist the tank at least twice a day. Use a terrarium fogger that mists the tank on a schedule. Also, put a small dish of water into the tank as well, even if the geckos don’t drink from it. Many commercially available insects will work. However, the insects need to be appropriately sized for your Gold Dust Day Geckos. You can feed crickets, roaches, mealworms, waxworms, silkworms, black soldier fly larva and hornworms as long as they’re small. Dust the insects with multivitamin and calcium (with D3) supplements before feeding. Offer the multivitamin once weekly, and offer the calcium every feeding for egg-laying females and every other day for non-breeding geckos. Gold Dust Day Geckos will also consume gecko diets that come in powdered form. You can also give fruits and honey as treats. Apparently, they like some fruit-based baby food, so every once in a while, give them this extra-special treat. 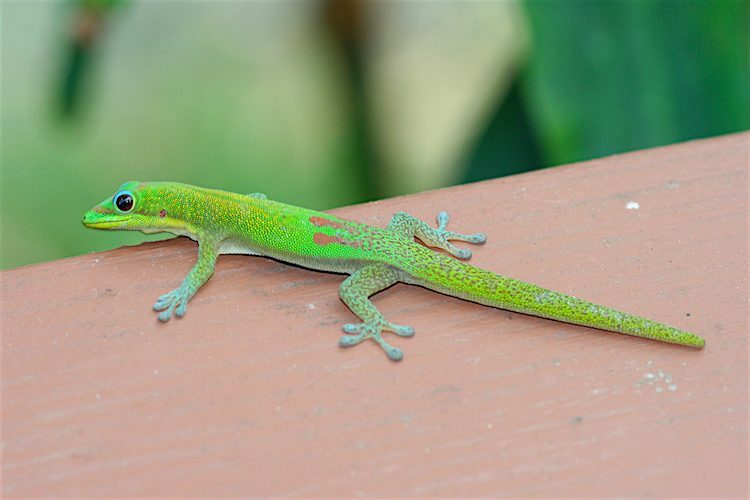 Be sure to schedule a new reptile visit with your exotics veterinarian when you get your Gold Dust Day Gecko. 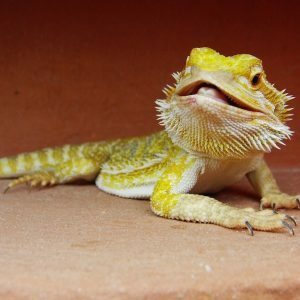 “The most important visit is the very first one, right after you acquire your pet reptile,” says Dr. Rick Axelson, DVM. Because of their small size and because they are easily stressed, Gold Dust Day Geckos are best kept as display animals. They are extremely susceptible to injury: Their skin tears easily, and they are prone to dropping their tails. However, with time, these geckos can become habituated to their keepers enough to remain active in their terrariums. Some may even take food from keepers’ hands. Watching their antics and observing their natural behaviors will make up for the look-don’t-touch nature of Gold Dust Day Geckos. Gold Dust Day Geckos are best for those who want something strikingly colorful but not overly difficult to care for. Their beauty is what draws you in, and their behavior and personality are what charms. 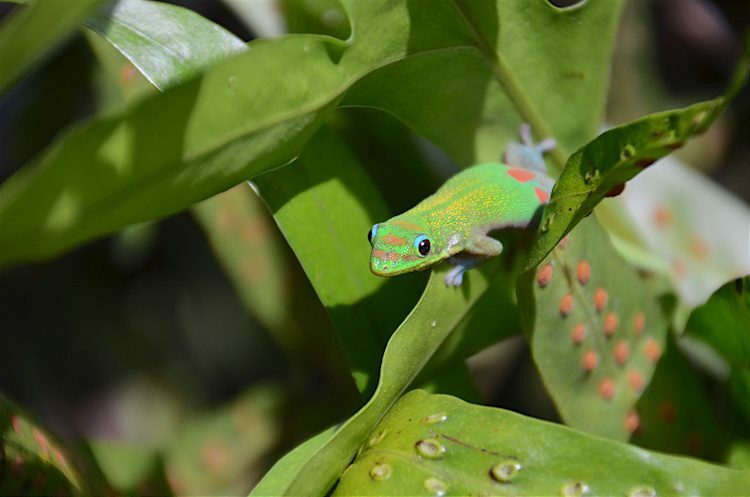 These jewel-like geckos are worth creating a little piece of forest paradise for.